Bringing Unique Home Comforts Into Your Home With DIY. I've lost count of the amount of blankets and throws I've purchased for my bedroom since I moved in here 18 months ago, I've got at least eight stored in my wardrobe, purchased for the intention of being used on my bed, but none of them suited when they was opened up. It means I've lost a fair bit of money - over £100 at least, because as soon as you take the tags off, or open the packaging, the items can't be returned, so they've just sat in my wardrobe, collecting dust I can say. I've also lost count of the amount of times I've been blanket/throw shopping, spending hours looking for a product that would be perfect for my bed, wasted hours I now can't get back. I've spent countless hours doing searches on the internet for what I think of being my dream blanket/throw, searched website after website, put so many products in my basket, to not go through with the purchase. Just when I thought about re-decorating my bedroom, just so I can have my dream look, but unfortunately in a different colour, the lovely Emily over at Twin Mummy and Daddy blog gave me the inspiration I needed! 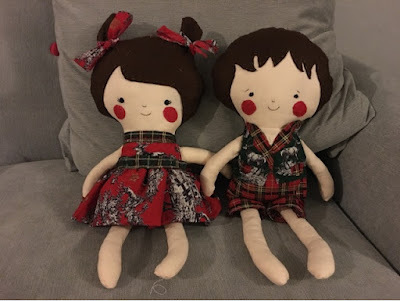 I'm a keen reader of Emily's blog, she writes about literally everything parent related, but she also mixes it up with lots of DIY/Arts and Crafts style post, and recently she's been making lots of items from dolls, elves and even a blanket! Emily made these elves from scratch! How talented is she!? You can read her post here. Now, whilst Emily is amazing at what she does, I've not picked up a needle for a few years! The last time I picked up a needle was to try and save a hole in one of my favourite tops, my aim was to sew it together to stop it getting any bigger, but I somehow managed to ruin the top even more, so I vowed never to attempt my own sewing repair again! However, thanks to my nan teaching me the basics of how to knit when I was younger, I'm not that bad at knitting believe it or not. I used to watch my nan with fascination, working the knitting needle over and over again to make beautiful patterns and designs. I soon had my very own little starter set, with my nan giving me unused wool and buying me my very own needles, I was most probably the only 11 year old of my era who had such an interest! My nan carried on with her knitting and still does to this day, but as I got older, I soon started to move onto different hobbies and interest (one of them being computers and writing! ), but I would still take note in the way my nan knitted, watching in amazement at how fast and perfect she made her creations. I also had to listen to my nan moan about the price of wool on the highstreet, and how it was working out cheaper to buy products themselves instead of making them. With the motivation I needed from Emily, last week I decided I would try and make my own blanket throw, using a pattern, and with the trusted help of my nan after a phonecall to her. I started looking around the very few fabric shops we have left in Reading, and soon recalled the conversation my nan and I had about the prices of materials. 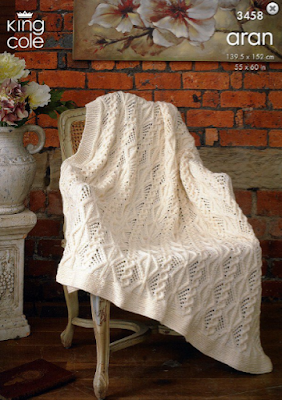 Whilst I want a blanket throw that suits my desire, I don't want to spend a fortune on having to make it. Coming home feeling defeated yet again, I decided to look around online, first checking out online selling market places, until I got a bit more specific with my search which led me to Deramores, the 2015 winner of the Best Online Knitting Store and after making my purchase last night, with a basket full of items, I can now see why they won such! I've decided to go with the pattern above, although it's not something I imagined, when I see it I instantly fell in love with it and pictured it in my room! Now I've just got to wait for my order to arrive and I can crack on, my lovely nan has said she will help me too, so there's no chance of me messing this one up! Hopefully this post will help people who like me haven't been able to find their perfect buy, sometimes we need a little bit of DIY in our lives to create the perfect look we want! Learning To Drive, The Provisional Story. Habito - Finding A Mortgage With Innovation! Upcycling: Scrap or Hidden Gem? Top Tips for Transforming a Child’s Bedroom! Our Mini Holiday To Weymouth 2016.